Bring a natural touch to your playing with these picks made from beautiful, durable tagua "vegetable ivory." Trying to strum with an inferior guitar pick? That's nuts. 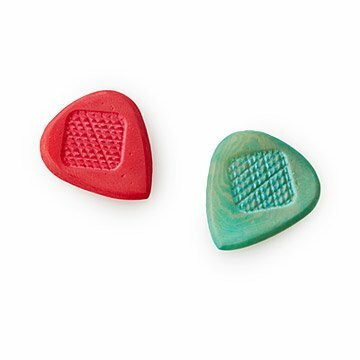 Bring a natural touch to your playing with these picks made from natural tagua. This nut "ivory" produces a clear, vibrant, warm tone, highlighting the sound of the instrument, not the pick. They offer superior clarity, control, attack, and durability in a sustainable alternative to plastic picks. With a textured grip that prevents slipping, these all-natural accessories will become go-to gear for any serious guitar player. Handmade by Brian Staebell in Rochester, New York. Brian Staebell's love of music began when he took up the guitar at eight years old. Although he didn't become a jukebox hero, he kept his love of craftsmanship and music alive as he ventured into business, marketing, and graphic design. While working as marketing director for a small music store in Batavia, New York, he began to explore the niche market for unique, high-end guitar picks. He started a venture to produce picks for this discerning market, quickly garnering international attention from some of the biggest publications in the guitar community. Soon, he moved his operation to Rochester, New York, and has focused exclusively on creating beautiful, long-lasting guitar picks and accessories for guitarists. 1) Tagua is heat/moisture reactive. Pick can curve with the heat from your hand. It will return to normal after setting it down for some time. 2) It may be a nut, but don't try to eat it! 3) Picks do not flex, so do not test them for flexibility. 4) To reshape, use medium grit sandpaper to desired tip shape. Can't wait to hear them used Christmas Day, while grandson is home on leave from Navy!